Holy propaganda slander South Korea. 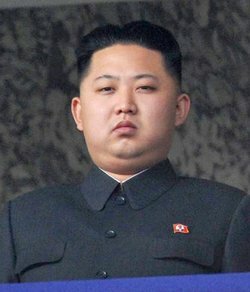 Kim Jong Um is so pissed by Seoul’s negative coverage of North Korea’s 66th anniversary of the Korean Children’s Union parade, he’s threatening to launch missiles to blow up all their media outlets. He’s talking to you, Chosun Ilbo and JoongAng Ilbo newspapers and KBS, CBS, MBC and SBS television stations. See, that’s what happens when you criticize his sneaky propaganda gimmicks that result in 20,000 children pledging their endless happiness to their new leader. “Monstrous mud-slinging” indeed. Somebody needs to take away that dude’s remote control. Maybe he needs a holiday. As long as it’s just the media he’s planning on blowing up. I’m actually in South Korea at the moment and for the time being. (internet is s-l-o-w) I got to tell ya, coming from Thailand this place IS a bit ..how shall I say..um “different”? I’m guessing you not going to pop over the border and say hi to Kim Jong Um for me?